CE 6065, or as she is more widely known, the 'Chivers', is a Leyland Subsidy 4-Tonner built in 1919. The Leyland 4-Tonner was built to War Department specification and entered for War Office Trials to determine its suitability for acceptance into the Subsidy Scheme prior to World War 1. Following acceptance into the scheme, it quickly became known as the Subsidy Model, as did similar models by other manufacturers. Leyland built something in the region of 6,500 for the war effort, with the majority allocated to the Royal Flying Corps (RFC) and the Royal Naval Air Service (RNAS). When the RFC and RNAS combined in 1918 to form the Royal Air Force (RAF), the Leyland became universally known as the 'RAF' type. By 1919 the model had been renamed Model G 36hp. The immediate post-war period was one of some confusion, so it is not possible to determine whether or not CE 6065 was originally intended for the War Office. The cessation of hostilities on 11 November 1918 certainly drastically reduced the numbers of new vehicles required by the War Office, but new vehicles were still required. The Armistice was only a ceasefire and the opportunity was taken to begin to re-equip for the unlikely event of the Armistice not holding. It was not until June 28 1919 that the signing of the Treaty of Versailles finally ended the war. The Ministry of Supply had in November 1918 orders with all the manufacturers for new vehicles and although production was continuous, vehicles were ordered in batches. Ministry of Supply records show that orders in progress were honoured, but not always, depending on the manufacturer and orders not yet started were cancelled but, again, not always. My inclination is that CE 6065 may have been originally intended for the Ministry of Supply but was never delivered to the military. Although CE 6065 was built in 1919, the registration date is not until 11 January 1921. A Chivers' employee considers that Chivers' buying policy at the time would have been to buy chassis cabs directly from Leyland. Chivers bought a batch of seven Leylands at this time, so is possible that the gap between build and registration was due to them being stockpiled and not registered until the bodies had been built. Alternatively, the original registration may have been 1919 and was changed when the vehicle was entered into the 'CE' register in 1921 for taxation purposes to comply with the 1920 Road Traffic Act. Chivers were based at Histon near Cambridge, hence the Cambridgeshire registration number. At the time, Chivers operated their own sawmill and bought all the timber for bodies and packing cases as round timber. Teams of skilled body builders built the bodies for the horse drawn vehicles and as motor vehicles began to infiltrate the fleet, their bodies were built following the same traditional methods. Each team was led by the 'Setterout' and no drawings appear to have ever existed. The only part of the bodybuilding contracted out was the signwriting, which was done by Mr Swainland, from Swainlands of Cambridge. 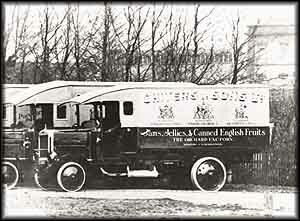 CE 6065 was used to deliver jams and jellies to shops, covering a wide radius of Cambridge. Regular journeys for the Leyland fleet were Birmingham, London, the Eastern Counties and occasional trunk work to York. Depending on the number of shops, each journey was of one or two days duration and a trailer was sometimes used with some of the Leylands. Whether CE 6065 was equipped for a trailer is not known. What is apparent, from conversations with old Chivers employees, is that the 4 tons carrying capacity was regarded very much as a guideline and not a set limit. The livery on CE 6065 was the same when built by Chivers in 1921 as it is today. All the Chivers Leylands carried the same livery, although in subsequent years, the livery on at least one, and probably all of them was changed. Although fitted with brackets for sprags, there is doubt whether they were ever fitted to CE 6065. It is known that seven hessian sacks containing grey painted sprags were delivered with the Leylands, which Chivers' storeman, Mr J Chapman, recalls languishing in the stores. Chivers at the time had their own well-equipped workshops and a policy of regular maintenance and refurbishment, so it appears they were regarded as not necessary, rather than time not being available to fit them. Founded in 1920 by a Mr Woods, Chivers' workshops consisted of main workshops in the main factory area with a wheelwrights shop and paint shop across the road. The Royal Commission on Transport in 1928 under the chairmanship of Sir Arthur Griffith Boscawen issued a report effectively restricting solid-tyred lorries to 12mph, while allowing 20mph for pneumatic-tyred lorries. This resulted in the Chivers fleet being converted to pneumatics on the front axle in their own workshops. Converting each lorry to pneumatics involved removing the body in the wheelwrights shop for refurbishment and re-painting, with the signwriting still entrusted to Mr Swainland. 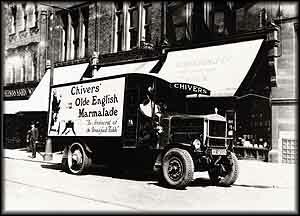 It was at this time that the livery was changed from the old 'Chivers and Sons' livery to 'Chivers Olde English Marmalade'. The chassis was then rolled across the road for converting and complete refurbishment at the same time. With its new lease of life, CE 6065 continued on shop delivery work until 1937 or possibly as late as 1938. It is believed that Harry Chapman was the regular driver, although Ernie Fewell and Elijah Ives also took a turn. Chivers' policy appears to have been to allocate a driver to a make of lorry rather than individual lorry. Leyland drivers would only have driven Leylands, Tillings Stevens drivers, only Tillings etc. When CE 6065 was retired from delivery work, the body was removed and a 400 or 500 gallon tank was fitted. In this guise CE 6065 supplemented the Chivers Works Fire Brigade and was stationed at Hasinfield Farm. At the time, Chivers were large landowners, owning many farms in the area. The majority of fires were hayricks, necessitating the transport of water to the fire and in addition to CE 6065 a 3000 gallon tank was fitted to an Albion chassis. As well as dealing with fires on their own land, the Chivers' Brigade was responsible for all fires in the Histon area and supplemented the Cambridgeshire County Fire Service when required. After 10 years fighting fires and over 25 years active service, CE 6065 was finally retired and left to deteriorate in her own time at Hasinfield Farm. When Oswald Chivers, later Sir Oswald, determined in the mid 1950's that some of the company's old vehicles were to be restored, CE 6065 was not intended for preservation. Instead, a Leyland fire engine, an open staircase double deck Leyland bus (believed the last with a petrol engine) and an Aveling and Porter steam roller were restored. Bill Edbrooke, Chivers' Transport Engineer and Manager from 1955 to 1960, later discovered CE 6065, still happily disappearing into the earth at Hasinfield Farm, and put forward proposals for its rescue. The response was that the budget for preservation had been spent and no more would be forthcoming. Bill, however, persevered and eventually secured a budget of £1000 with the proviso that not a single penny more would be spent. CE 6065 was returned to the workshops where it was completely stripped down and restored by Chivers' workshop staff under Bill's supervision. With all mechanical parts refurbished and ten coats of ICI paint, the rolling chassis was completed and attention turned to the body. A new body was built from scratch, using as far as possible the same method and materials as in 1921. This was supervised by one of the original body builders as no drawings existed, although a lightweight floor replaced the original in the interests of saving weight as no load was intended to be carried. The resultant body differs slightly to that originally carried by CE 6065, although the style does match that carried by one of her sisters in 1921. The original seven Leylands in 1921 had three different body styles, depending on which team built them, although the differences were very slight and mainly confined to the canopy shape. All the work was carried out by Chivers' staff except the hand painting of the Coats of Arms on the body. Even with a budget of £1000, it was necessary to allocate time spent on it to vehicles in the modern fleet in order to remain within budget and ensure CE 6065's completion in 1959. Originally restored with pneumatics, CE 6065 was rallied extensively in the Eastern Counties by the workshop staff. It was at one of these rallies that information about a suitable axle for solids became available. That axle was retrieved from a Lancashire field and the search for suitable wheels began. It transpired that the Dunlop Rim and Wheel Company still had the original drawings and they made two new wheels and presented them to Chivers free of charge. This enabled CE 6065 to be returned to its 1921 specification. In 1960, Chivers and Sons became part of the Schweppes Group and the fate of CE 6065 again hung in the balance. Just as Bill Edbrooke had previously ensured her survival, this time Mr Frank Harper, who was Schweppes' Transport Engineer at the time, was entirely responsible for her safety. 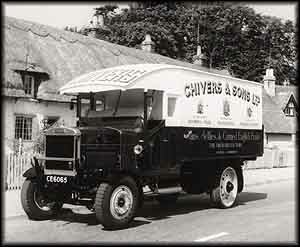 Schweppes had ordered the disposal of all the old vehicles acquired from Chivers. CE 6065 was originally offered to Leyland Motors, who declined the offer, as did the British Transport Commission and various museums. With no new home able to be found, Schweppes ordered the scrapping of CE 6065, an action delayed by Frank Harper. John Scott, a Schweppes manager and vintage car enthusiast, mentioned to Lord Montagu the plight of CE 6065 at a car rally. Lord Montagu suggested that the newly formed Historic Commercial Vehicle Club might be interested. As a result of that meeting, Frank Harper drove CE 6065 from Clapham to Brighton on the inaugural London to Brighton Run in 1962. On Brighton seafront, Frank presented CE 6065 to Lord Montagu who accepted it on behalf of H.C.V.C. and a letter was placed on file at Schweppes head office confirming the presentation. From that moment on, CE 6065 became universally known as the 'Chivers'. Housed initially in a museum at Measham, the Chivers was soon relocated to Carlton Coalville where it joined the club's Leyland Titan. From here it attended rallies in the East Anglia region and was a regular entrant on the London to Brighton Run. In the early 1970's some remedial paintwork repairs were carried out and the Chivers spent time in the custody of the Yorkshire Area, attending many local rallies and completing the Trans Pennine Run. By the mid-70's it was housed again at Carlton Coalville. In 1979, the Chivers was moved to the Chiltern Area for the duration of one rally season, where it remained until being retired to the British Commercial Vehicle Museum around 1990. The Chiver's retirement was rudely interrupted when it was removed from the BCVM in early 2011 for a thorough examination and some remedial work by Seb Marshall in preparation for the 50th running of the London to Brighton run. Some twenty years after her last appearance, the Chivers once again graced Madeira Drive. The summer of 2011 was spent at Milestones Museum at Basingstoke, Hampshire where it ventured out onto the HCVS South Midlands Ridgeway Run, and the Thornycroft Society's Hampshire Road Run from Milestones among other local events. It is pleasing to see that, half a century after her original restoration, she still attracts great interest and admiration and provides a great presence for the HCVS wherever she is displayed. Engine: 34hp 4 cylinder petrol. Transmission: 4 speed gearbox with reverse gear. Ferodo lined cone clutch. Double reduction bevel rear axle. Brakes: Handbrake to rear wheels. There are reports of a water cooled transmission brake, but none seem to have been used on Subsidy models. Body: Wood and Thamescloth construction with 3 seat cab, open to front and sides. Length: Internal, 13'2" - external, 14'0" including tailboard. Width: Internal, 6'1" - external, 6'7". Height: Internal, 6'2" - overall, 10'8". Overall dimensions: Length: 22'7" Width: 6'8" Wheelbase: 13'10"
Unladen weight: 4 tons 19 cwt. Date first registered: 11 January 1921.